Status: Still chubby, although arms are noticeably less squishy. Work-out: Jillian Michaels 30 Day Shred, although it’s more like the 60 Day Shred with the occasional day off so that I might collapse in a nervous heap after rehearsals. Parts of the body that hate me: My knees don’t like this work-out. They don’t like it one bit. I have taken to using a pillow during push-up time, but lunges are still a chore. Percent I want to kill Jillian Michaels: It’s down to 75% now. Those lunges and squats are still killing me though. See above as to why. Exercises that still confuse me: Bicycle crunches. HOW THE HECK DO YOU DO THOSE?! Accomplishments I should be proud of: I can now do a few push-ups non-girly style! Also the cardio sections of the work-out are easy as pie. I am a cardio god! And for the hour or so after I do the work-out, I feel accomplished. Ego-boost of the week: Someone told me I looked somewhat slimmer. Though it might have been my awesome t-shirt. One event that somehow erases the ego-boost: the costume designer handed me a pair of pants to try on. I could already see they were about four sizes smaller than what I’ve been wearing. She made me try them on anyway. I couldn’t even pull them all the way up. Stoopid pants. 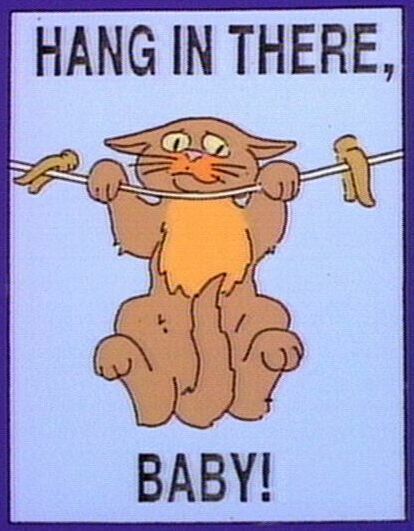 Cheesy catch-phrase I am telling myself: Hang in there! Posted on March 27, 2014, in ramblings and tagged hang in there, workouts. Bookmark the permalink. Leave a comment.